Blessed on all sides by the natural bounty of mountains, rivers and the sea, Kanazawa is renowned for its culinary culture, with super fresh seafood from the Sea of Japan, sweet white rice grown with natural mineral waters, and unique varieties of healthy Kaga vegetables. 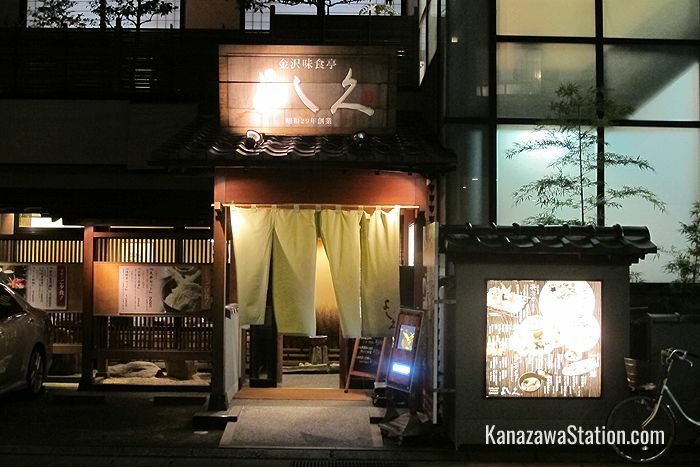 In this article we highlight five essential specialties that you should try in Kanazawa and tell you where to find them. 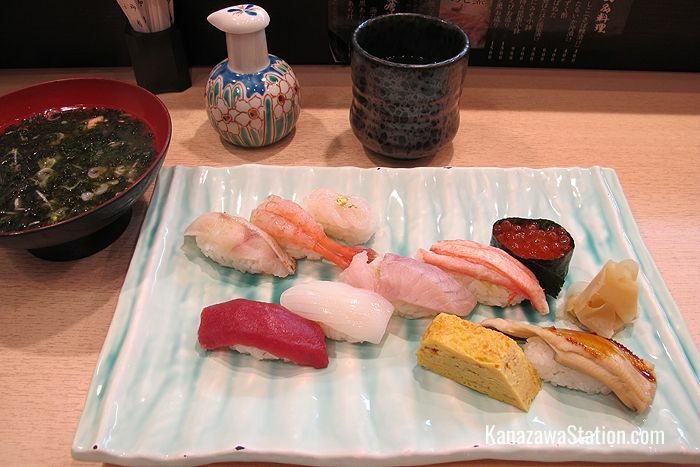 If there is one thing you must eat in Kanazawa it is sushi. Even in a cheap “conveyor belt sushi” store you will be surprised at just how good the local sushi is. Although there are many fine sushi restaurants in this city, if you ask any Kanazawa local for their recommendation, everyone will tell you to go to Maimon Sushi. Specifically they will recommend Maimon Sushi Honten, the head restaurant of the chain. However, although the sushi served at this main branch is truly delicious, the location just off the Hokuriku Expressway is not very convenient and if you don’t have access to a car, you will need to take a taxi. Fortunately, there is a smaller branch of Maimon Sushi just inside Kanazawa Station. This smaller store is also extremely popular so if you want to have lunch or dinner here it’s a good idea to arrive just a little before, or just a little after the peak period or be prepared to wait. 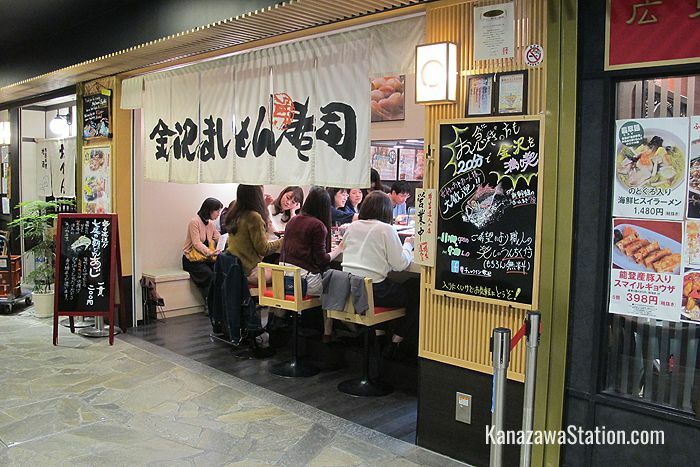 Location: You can find the Kanazawa Station branch of Maimon Sushi inside the Ajiwai Koji section of the Anto shopping mall on the south side of the station building. 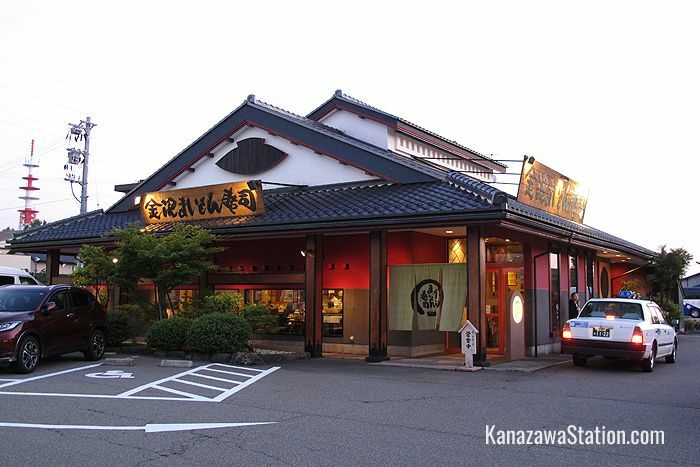 The main branch of Maimon Sushi is located a 15 minute drive from Kanazawa Station. Here is a map of the main branch’s location. 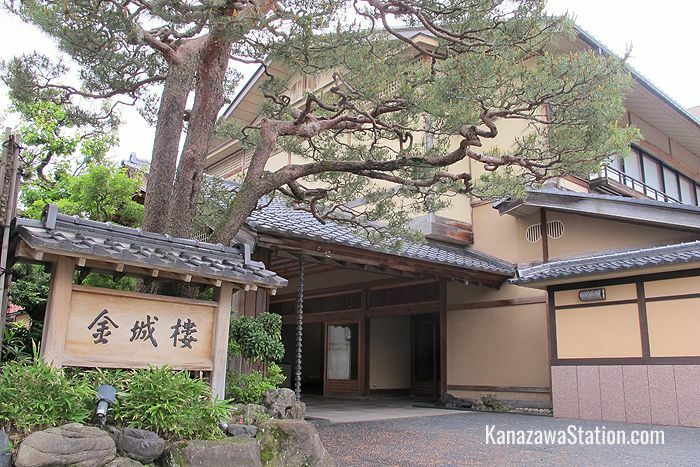 One of the best culinary experiences you can have in Kanazawa is a meal at the luxury ryokan style inn, Kinjohro. 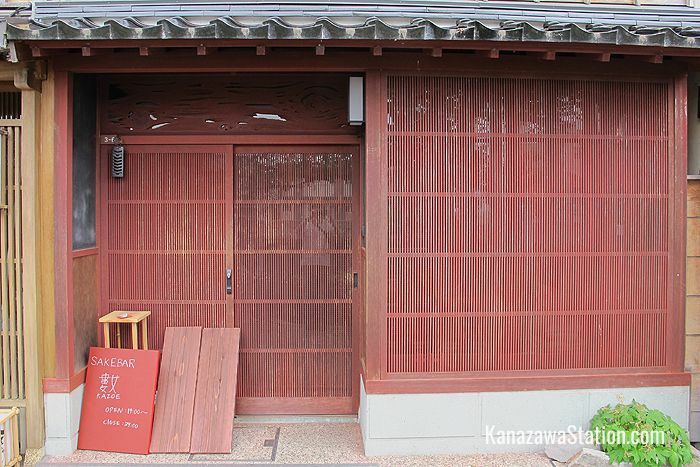 This inn doubles as a ryotei style restaurant and serves multi-course meals of Kaga ryori, the original cuisine of the Kanazawa area. An exquisite series of culinary delights are served in spacious private rooms with garden views. The service is impeccable and the in-house “Taka-no-ha” sake is a flavorful treat that will perfectly complement your meal. As a hotel Kinjohro is quite pricey. It is the kind of high class establishment that has a secret back door for celebrity guests. However, lunch time set meals are quite affordable, and the cheapest course at 5,000 yen is very substantial. 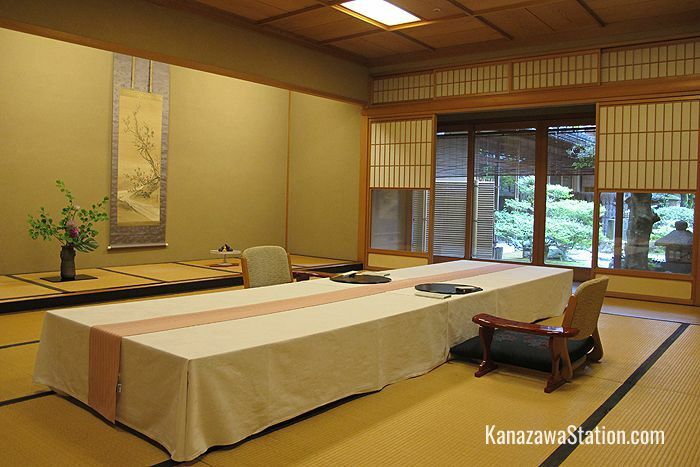 It is entirely worth it for a one-of-a-kind taste of luxury ryokan life. The ryokan also has beautiful interiors and furnishings, and if you ask nicely, the staff will happily show you around after your meal. Location: Kinjohro is a short walk south of the Higashi Chaya-gai district. Here is a map of the location. 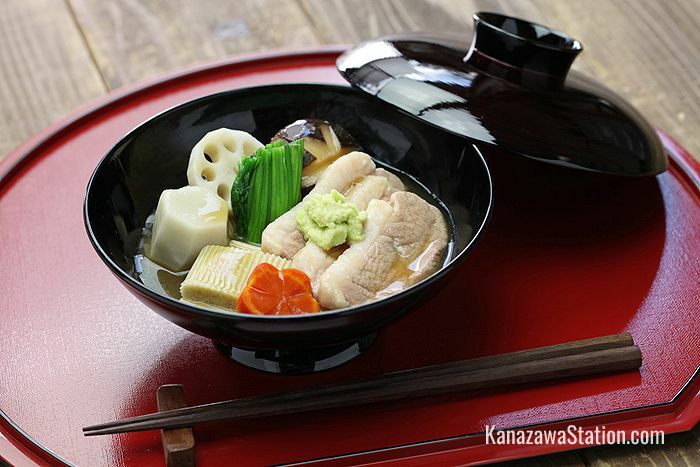 Traditionally Buddhist monks were prohibited from eating meat, so they created a healthy and flavorful vegetarian cuisine called shojin ryori. You can try this tasty vegan fare for yourself at Tenten Nomachi, a tiny little eatery in the heart of the Teramachi temple district. 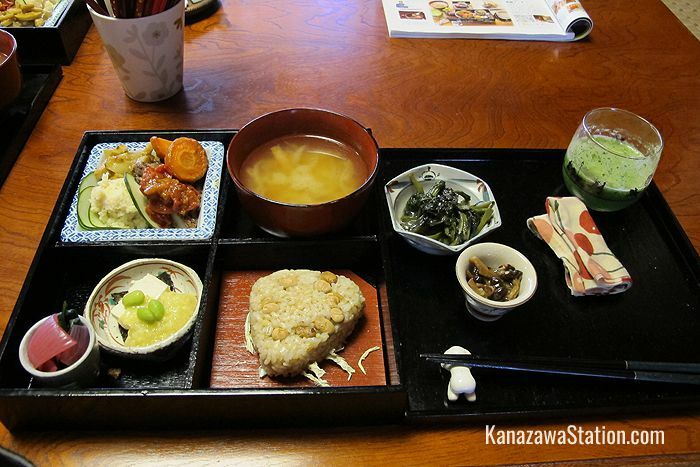 The food is prepared and served by ordained Buddhist nun, Yonezawa Myosei, in the comfortable living room of her house. Her ingenious concoctions of vegetables, mushrooms, tofu and beans are delicious. Tenten Nomachi is only open officially on Sundays and Mondays, but if you call to book ahead (in Japanese) she can open up specially for you on other days too. 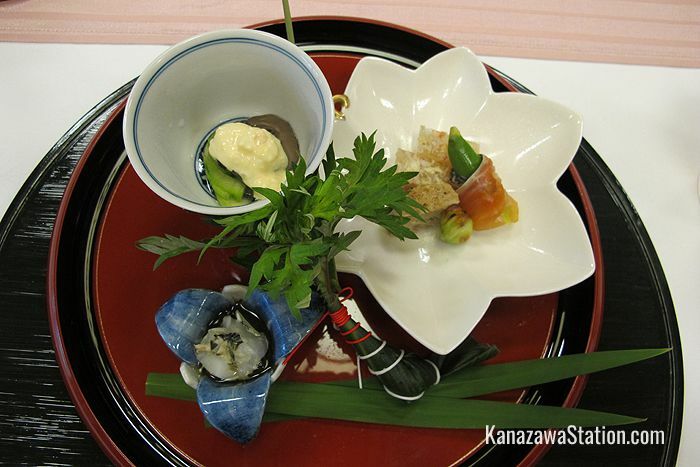 Meals cost between 1,000 – 3,000 yen. 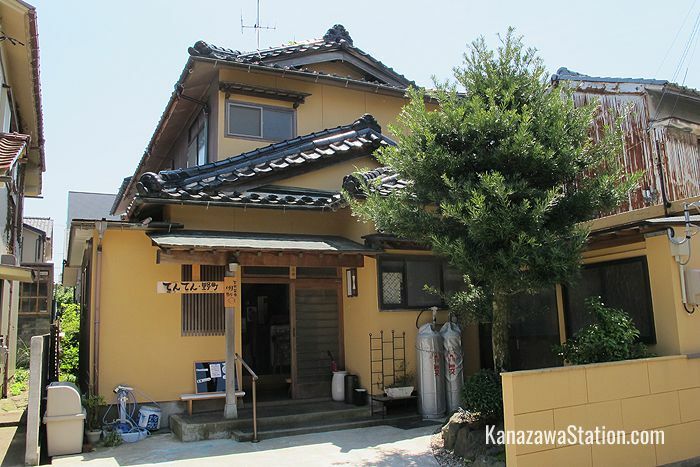 Location: Tenten Nomachi is a short walk from the Ninja Temple in the heart of the Teramachi district. Here is a map of the location. 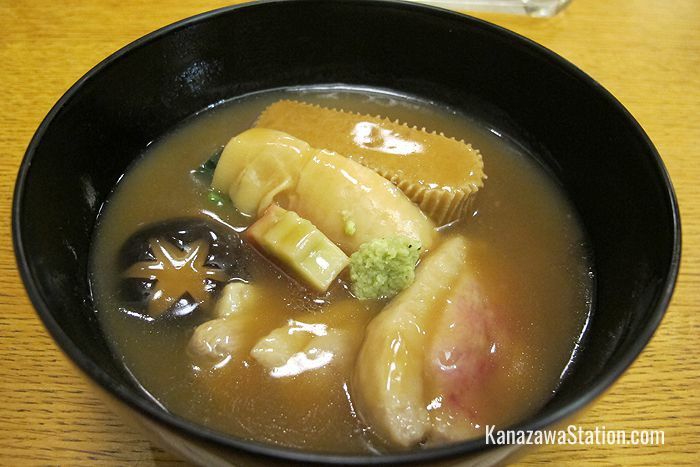 Jibuni is a thick soy based broth of gluten, mushrooms, and thinly sliced duck and it is Kanazawa’s signature dish. If you want a taste of the local home kitchen cooking, then you really have to try this local comfort food. Some restaurants serve it with chicken, but real jibuni is served with duck. Yoshihisa is a cozy, casual restaurant close to Kanazawa Station that serves jibuni, along with excellent tempura, and sake rice wine tasting sets and all at very reasonable prices. 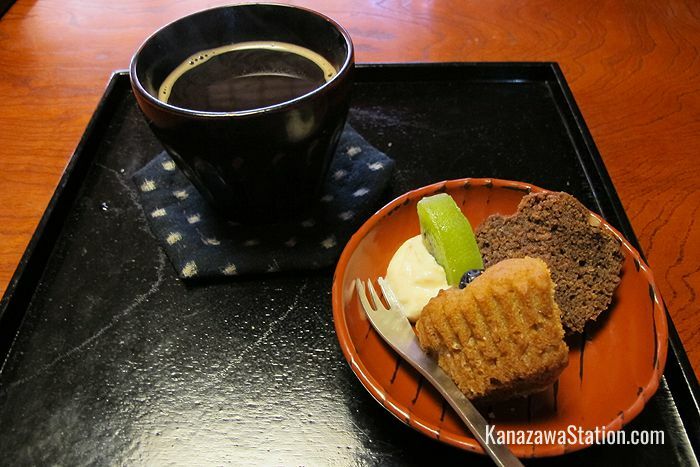 Location: Yoshihisa is a 7 minute walk south of Kanazawa Station. Here is a map of the location. Ishikawa Prefecture is well known for its delicious rice, so it’s not surprising that there are plenty of rice wine breweries here too. Kazoe is a stylish bar in a converted Kazuemachi teahouse that provides the perfect atmosphere for the quiet contemplation of local sake. You can sit at the counter or stretch out on a tatami floored room. There’s no menu but there are over a hundred varieties in stock, and the owner of the bar, Takagi Makoto, is a qualified sake taster who can recommend different drinks to suit your taste. If you don’t know much about sake then it’s a good idea to let your host choose for you and give your taste buds a little adventure. Closed on Sundays and every 2nd Monday of the month. 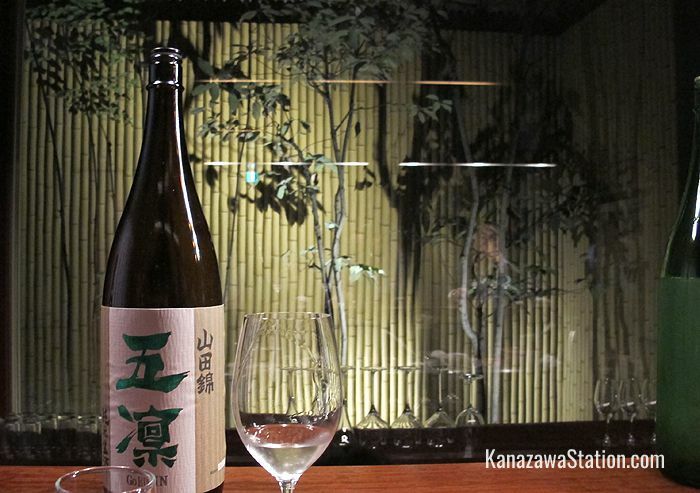 Location: Sake Bar Kazoe is located on a river front lane in the historical Kazuemachi district. Here is a map of the location.